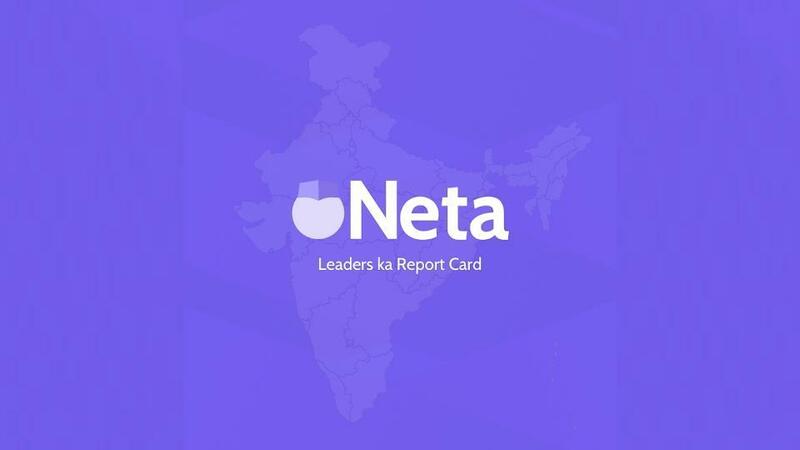 The Neta app, which sprung up last year and allows users to rate their leaders, has some murky connections to media houses, political analysts and big businesses, raising red flags on the possible misuse of data. 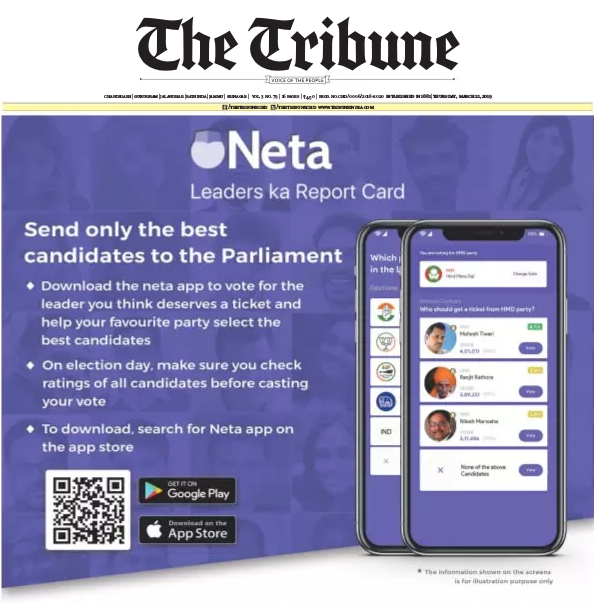 It promises people to help them “send only the best candidates to the parliament” and suggested that they “download the Neta app to vote for the leader you think deserves a ticket and help your favourite party select the best candidate”. It also offers an incentive by saying “download the Neta app and get a chance to win Rs 10,000″. A line at the bottom said, “issued in public interest” and provided the address of a website neta.co.in. A visit to this website revealed that the “team behind Neta… consists of passionate journalists, technologists and media veterans who are trying to make the Indian democracy better”. It says that “Neta was founded by Pratham Mittal, a Doon School and Penn graduate who previously founded Outgrow (one of the top polling technology companies)”. It further mentions that its “CEO is Robin Sharma, who previously co-founded CAG with Prashant Kishore” and that their “teams are based in Delhi, Jalandhar and Mumbai”. CAG stands for Citizens for Accountable Governance and Prashant Kishore has been a consultant-strategist with several political parties in various elections and is now the vice president of the Janata Dal (United). Mittal also reportedly said that “over 15 million verified voters have already rated or reviewed their local leaders across 543 parliamentary constituencies and 4120 assembly constituencies…We are eyeing 100 million before 2019 elections”. The app was launched on August 24, 2018, in the national capital with former president Pranab Mukherjee as chief guest, and former chief election commissioners S.Y. Quraishi and Nasim Zaidi in attendance. Work on the app is reported to have begun “in September 2017, (when) Mittal and his team began working on Neta out of his Shanti Informatics office in New Delhi, which was set up for the purposes of developing the app”. He tells The Better India that the funding same from his personal stake in Outgrow and his family. Even though this is a for-profit venture, “we are also not looking to monetise the platform for as of now. The idea is to first focus on building credibility”. It seems the app has been developed by a company which appears to have been closed since at least July 2017. This came across as mysterious, so we dug deeper. Since the website of the Neta app mentioned Lovely Professional University, a quick search led to a report referring to the Lovely Group’s “classic rags-to-riches tale”. The Group is reported to have had humble beginnings in 1961 with a 10×10 sweet shop called Lovely Sweets “making and selling laddoos in Jalandhar Cantonment”. The small shop has now grown “to five-floor structure”. It “has also entered bakery with the label Lovely Bake Studio under Shaishav’s control and is currently in talks with franchise consulting services provider Francorp India to scale up Lovely Sweets within north India initially through franchising model”. The origin of the Lovely Professional University is reported to have been a “college on 3.5-acre land in Phagwara, Punjab” which is now supposed to have “become India’s largest university in terms of number of students, which is around 30,000 from 30 countries”. It has now “also started Lovely Academy for test preparation and Lovely Wannabuy, which is into offline FMCG retail”. According to the report, the Group also has an “automobile business with six new offices in Punjab and leading and maintaining the market share in auto dealership business in north India except Delhi”. Some interesting information about the investors behind the Neta app comes from VCCircle (acquired by NewsCorp in 2015) which calls itself “pre-eminent source of news, information, data and analysis on alternative investments in India”. A report dated February 20, 2019 states that Neta “has struck an ad-for-equity deal worth $10 million (around Rs 71 crore) with a clutch of Indian media groups”. This report goes on to describe “ad-for-equity deals” as “a media house taking an equity stake in companies in exchange for giving them advertising space”. It further names “entities associated with The Times of India, Hindustan Times, Republic TV, Network 18 and NewsX”. Interestingly, the report also says that “Network18 has denied that there was any transaction”. 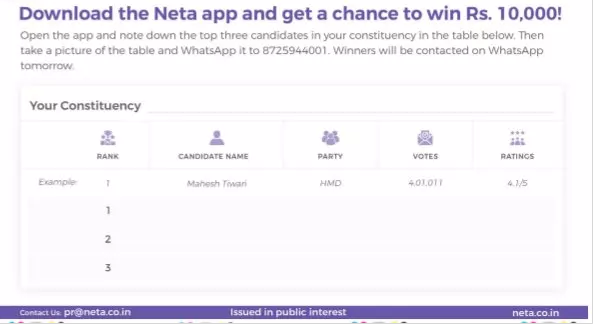 How the Neta app work? “1. Download the app or open their website. 3. See all MP and MLA candidates. 4. Assess their ranking, ratings and reviews. 5. Vote for your favourite candidate. 6. If you are unsatisfied, either change your vote or give lower rating to them. In terms of actual usage, the first screen on the website gives two options: (1) “GET THE APP LINK”, and (2) “ACCESS THE WEBSITE”. For getting the app link, one has to give one’s phone number. If one clicks on accessing the website, the next screen asks you to choose your constituency, either by pin code or name of the constituency. Once you have done that, you are led to the next screen which asks you to take two actions: (1) Vote for general election 2019, and (2) Rate your Prime Minister. For voting in the the general election category, one is asked to vote for one of eight options: BJP, Congress, Aam Aadmi Party, RaJPa, Trinamool Congress, BSP, Independent, NOTA. (The acronym “RaJPa” is not explained). For rating the prime minister, one is given a five-point scale, with “one” representing “Very Angry” and “five” representing “Very Happy”. The five-point scale, with “one” representing “Very Angry” and “five” representing “Very Happy”. – There is an app which has the potential to influence voters because its internal working does not seem to be clear or transparent. – The app collects mobile numbers of users and asks them about their preferences for political parties and politicians. This has a potential to create a large-scale database of identifiable individuals with their voting preferences. – Work on the app is claimed to have been begun in “September 2017” when “team began working on Neta out of his Shanti Informatics office in New Delhi, which was set up for the purposes of developing the app”. – The company was struck off by the Registrar of Companies by July 26, 2017, seemingly even before work began on developing the app. – Some members of top management have been associated with a former well-known political strategy consultant and have actively worked on behalf of certain politicians and parties for their election campaigns. – Some media houses seem to have decided to invest in this app. – The founder-developer belongs to a family which own a business group which has interests in sweets, education, and automobiles. This appears to be curious mixture. A possible cause of concern is the potential for gathering of voter information, directly or indirectly influencing voters on behalf of one or another political party, misuse (even inadvertent) of voter information. These apprehensions can become scary when seen in the light of Cambridge Analytica, the US elections and the suspected Russian attempts to influence it, the Facebook controversy, and lastly the confusion about our own Aadhaar data leakage/security issues. It therefore seems necessary for the Election Commission of India to satisfy itself and the voters that this effort does not pose any threat to the integrity of democracy in India in general and the 2019 election in particular. Jaskirat Singh is a software/information technology professional. Jagdeep S. Chhokar is a former professor, Dean, and Director In-charge of IIM Ahmedabad. “Shanti” happens to be a common name and the “Shanti Informatics” referred to in the article above has no connection with Neta. In fact, Neta app was conceptualised after the striking off of the aforementioned company. The Neta app and its parent company have nothing to do with the Lovely Professional University, apart from the fact that I belong to the family. There are no financial or management ties involved, whatsoever. While we are in the process of raising funds, we have not yet raised any outside funding till now. Robin Sharma, our former CEO, has been in election campaigning for a while. He has worked with multiple parties, including the BJP and the Congress as a consultant. During the time he was working for Neta, he had no connections to political parties. First, we do not store user phone numbers. We only use the phone number to verify the users once. Thus, there is no way for us to associate activity on the app with any particular user. This, I believe, answers the most important doubt. Second, our ratings are a proxy for an opinion poll. Such opinion polls are showcased by all TV channels and media organisations on a daily basis. All of our data and use of data abides by the election commission’s rules and regulations. Finally, our intent is to make our leaders accountable. And I think our ratings are doing a good job of a watchdog on our leaders. We believe that we are doing something very important. We are happy to be scrutinised and held to high standards. Whether “’Shanti Informatics’ referred to in the article has no connection with Neta” or not, can be assessed based on the statement “So, in September 2017, Mittal and his team began working on Neta out of his Shanti Informatics office in New Delhi, which was set up for the purposes of developing the app,” which is contained in https://www.thebetterindia.com/156467/neta-app-pratham-mittal-politicians/, to which the founder is reported to have spoken. Also, the Google Apps where this app is available for downloading (https://play.google.com/store/apps/details?id=in.netaapp&hl=en_IN) shows even on March 25, 2019, at 12:30 PM when it was last accessed, says “Offered By Shanti Informatics”. This observation, in no way, disputes that the former CEO had “previously co-founded CAG with Prashant Kishore” what our piece says. Whether this “answers the most important doubt” or not is left to the readers. This statement does seem to agree that a doubt can exist. It has not been said or implied that any of “the Election Commission’s rules and regulations” have been flouted.